There is no question about it: At Fuller Concrete Staining we stand behind our work. We don’t want another person to drive up to an ugly, gray, dirty driveway. We don’t want one more family to live with a dinghy pool deck. We want everyone to know about the incredible results they can get with Concrete Driveway Staining in Aliso Viejo CA. If you are on the fence between painting and staining your driveway, we can stop you there: Staining is 100% better. When you paint, you are simply adding a layer of color to the top of your concrete. 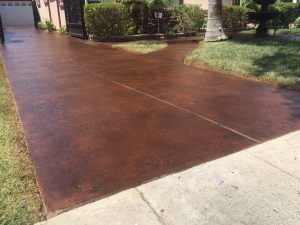 On the other hand, Concrete Driveway Staining in Aliso Viejo CA allows the color to penetrate into the pores of the concrete. It will last longer, be less likely to peel, chip, or fade, and will be resistant to UV rays – none of which can be said about paint.